It is most important to look after your cooking equipment as it can easily be damaged. Caring for your kitchen implements is a part of being a cook – there is no point in thinking that cooking is just about creating lovely meals for your family. It’s about writing good shopping lists that make the most of seasonal produce, taking care to prepare ingredients without wasting anything and knowing how to turn simple things into something wonderful. Caring for your cooking equipment properly will see your things last for many years – grandmothers have passed down iron casserole dishes to their daughters and granddaughters because they have carefully used and cleaned them, time after time. With the easy, cheap availability of some kitchen equipment, such as Tupperware boxes and plain white crockery, not everyone wants to keep things for a lifetime, or even many years at all, but, if you have paid good money for quality kitchen equipment, it is worth looking after. Here are some hints and tips for the type of cooking equipment that can be expensive to buy, but a pleasure to use. Looking after these things will help them to last, giving you and your grand children something to share. Cooking with a set of good quality knives is a joy. When you first use a decent knife you will appreciate the difference. It is often the case that German or Japanese brands are the best, although there are often good deals to be had. Some chefs may balk at the idea of a wooden block knife set, but as long as you buy a good quality set, it can be a very practical kitchen solution. 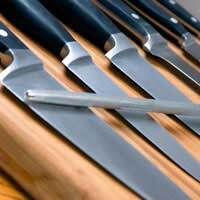 Look for knives that have solid handles that are separately secured to the blade – no moulded knives please. Caring for your knives means washing them carefully by hand, with warm soapy water, after every use. Dry them individually and thoroughly. Don’t have them standing upright in the cutlery drainer or you will blunt them, or worse, skew the blade. Keep your knives nice and sharp, too. A good block will have a sharpener in it. Use it frequently and take your knives to be professionally sharpened every couple of years – your local butcher will know where to go, or may do it himself. Good quality, heavy based casserole dishes last more than a lifetime. If you buy cast iron cook wear, you need to take care of it and you will enjoy its beauty and functionality. The most important thin to note when caring for cast iron cooking equipment is not to allow it to change temperature too quickly, too drastically. Let’s say you made a lasagne in it and froze it. Don’t just bung the frozen dish into a heated oven – it will crack and be ruined as you can’t repair them effectively. You can cook from frozen, but you must put the frozen dish into the oven before you turn it on so that it warms up gradually as the oven heats. Can I purchase a handle for a frying pan, it is spring loaded, my wife dropped it and has broken.